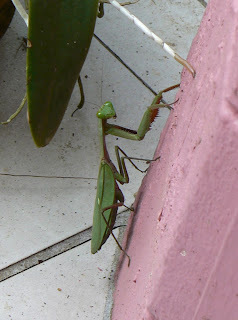 Traffic slowed on ther front doorstep as guests were leaving yesterday morning - all stopped to watch this cute Praying Mantis making it's 2-steps-forward-1-step-back progress across the doormat and then up the wall. They are fairly common but this was quite a big one - about hand-size. The Cassowary appeared on the walking track yesterday which really thrilled the guests who spotted him. He's still quite wary and took off through the fence at 90 kph!